Acupuncture for Weight Loss - Can It Really Help? Acupuncture is a needle-based alternative therapy sometimes used for weight loss. Long practiced in traditional Chinese medicine, acupuncture is thought to stimulate the body's flow of vital energy (or "chi") and, in turn, improve several factors known to contribute to obesity. Although scientists aren't sure what the mechanism might be, it's thought that undergoing acupuncture may suppress appetite, boost metabolism, and reduce stress. However, these theories have yet to be extensively tested in scientific studies. The Research: Does Acupuncture Really Work for Weight Loss? Although there is relatively little scientific support for the theory that acupuncture can promote weight loss, some studies suggest that acupuncture may be of some benefit to people looking to lose weight. In a research review published in the International Journal of Obesity in 2009, for instance, scientists analyzed 31 studies (with a total of 3,013 participants) and found that acupuncture was associated with a significant reduction in average body weight. However, the review's authors caution that many of the reviewed studies were of poor quality. Also, clinical trials on acupuncture vary greatly, as there is no consensus on the most appropriate sham intervention, making it difficult to compare study results. In a study published in Acupuncture in Medicine in 2012, researchers gave women either acupuncture or sham acupuncture (non-penetrating acupuncture at the same points). After two 20-minute sessions per week for five weeks, hormone levels were measured. Women who received acupuncture had decreased insulin and leptin levels and a decrease in body mass index (BMI) compared to the women who received sham acupuncture. Other research on acupuncture and weight loss has yielded mixed results. For instance, in a 2017 review, researchers analyzed previously published clinical trials on laser acupuncture for obesity management. While some positive effects were seen in body weight, body mass index, waist circumference, and waist-to-hip ratio, the researchers concluded that the lack of high-quality studies made it impossible to reach a definitive conclusion about the effectiveness of laser acupuncture for obesity. Typically, a licensed acupuncturist will select a number of acupuncture points which may vary from person to person. Thin acupuncture needles are inserted into acupuncture points. The points may be on the body and/or on the outer ear. Acupuncture points on the body often include: Neiguan (P 6), Fenglong (St 40), Liangmen (St 21), Guanyuan (R4), Zusanli (St 36), Tianshu (St 25), and Quchi (LI 11). Common ear acupuncture points include Shenmen, Spleen, Stomach, Hunger, and Endocrine. If needles are used on the ear, they are inserted to a very shallow depth. Acupuncturists may use electro-acupuncture (also known as laser acupuncture), stimulating the points gently with a metal probe instead of acupuncture needles. 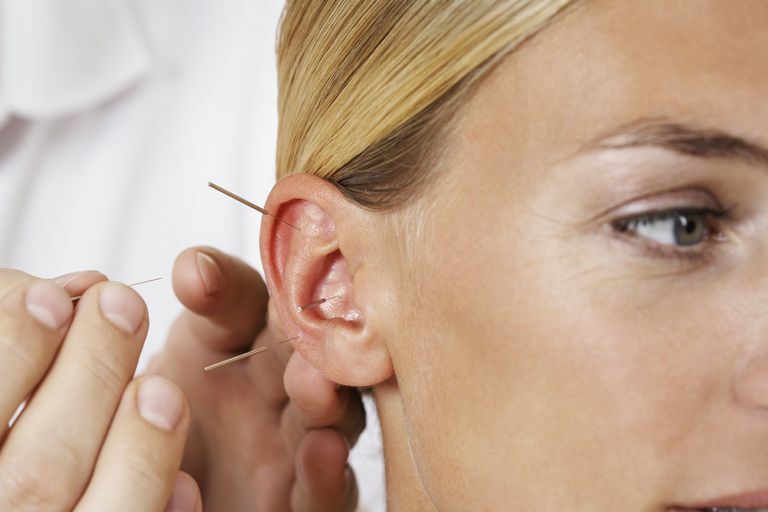 Some acupuncturists apply a pellet or ear "seed" over certain acupuncture points on the ear. Held in place with tape, they are usually left in place for several days and can be massaged periodically (to gently stimulate the acupuncture point) to help with cravings. Acupuncture should only be administered by a qualified healthcare professional who is licensed to practice acupuncture. While the risks are generally considered low if done by a competent licensed practitioner, side effects may include soreness, bleeding, bruising, infection, and injury or organ puncture due to improper needling depth. Sterile, disposable (single-use) needles should only be used during acupuncture. If you have a bleeding disorder, weakened immune system, pacemaker, or are taking blood-thinning medication or supplements (such as warfarin or garlic), you may not be a good candidate for acupuncture. If you are pregnant, you should speak with your physician before getting acupuncture. Ear acupuncture shouldn't be confused with ear stapling, a procedure that has been found to carry a significant risk of complications including infection and deformity. Should you try acupuncture for weight loss? The current evidence isn't strong enough to show that it can lead to weight loss. If you're still considering trying it, be sure to talk with your healthcare provider first to weigh the pros and cons and discuss other strategies that may be right for you. Cho SH, Lee JS, Thabane L, Lee J. Acupuncture for obesity: a systematic review and meta-analysis. Int J Obes (Lond). 2009 33(2):183-96. Namazi N, Khodamoradi K, Larijani B, Ayati MH. Is laser acupuncture an effective complementary therapy for obesity management? A systematic review of clinical trials. Acupunct Med. 2017 Dec;35(6):452-459. Nourshahi M, Ahmadizad S, Nikbakht H, Heidarnia MA, Ernst E. The effects of triple therapy (acupuncture, diet and exercise) on body weight: a randomized, clinical trial. Int J Obes (Lond). 2009 May;33(5):583-7. Sui Y, Zhao HL, Wong VC, et al. A Systematic Review on Use of Chinese Medicine and Acupuncture for Treatment of Obesity. Obes Rev. 2012 May;13(5):409-30.